uuid : 0f762846-96b0-4e96-9a10-e63ea5f5b42e templates_id: 119475 templates_uuid: "2110d8d0-dfd1-4609-a479-05a7322bbba6" title: "How to write an appeal letter - Appeal letter to an employer - Appeal letter" display_name: "Appeal letter" meta_keywords: "Employee notice of appeal " description: "
Write an appeal letter with this appeal letter template when you want to make a formal appeal against your employer. This letter of appeal covers appeals against a disciplinary decision, a dismissal, a redundancy or other discriminating decisions against you, ie an unfair refusal to your flexible working request. Set out the grounds of your appeal including incorrect evidence, new evidence, problems with the decision process or unfair selection grounds and incorrect reasons for redundancy. You can also choose to be accompanied by someone at the appeal hearing. 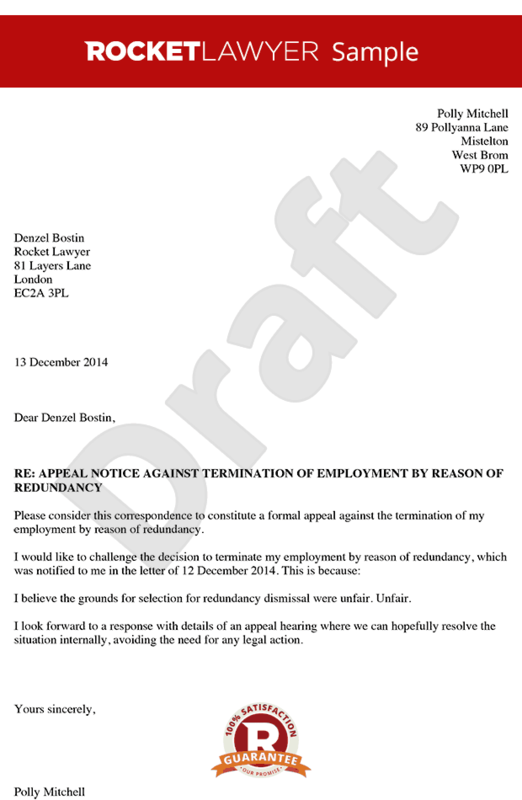 An appeal letter is a letter that allows you to make a formal appeal against your employer. It sets out what decision is being appealed and the grounds for appeal. Do I need an appeal letter? You need an appeal letter when you are handed with first or final written warning with which you disagree and you want to make it clear to your employer, eg. against a dismissal or when you are being made redundant. What types of decisions can you appeal using this letter? Can someone accompany you to the appeal hearing? You can choose to be accompanied by a colleague or a trade union representative. Your employer or HR officer cannot refuse this request. In this letter you can choose to be accompanied by your colleague or trade union representative. This employee notice of appeal is governed by the law of England and Wales.
" created_timestamp: "2018-10-08 04:36:13.0" modified_timestamp: "2018-10-08 04:36:13.0" active: true created_by: 102 modified_by: 102 dcm_id: 333 url_slug: "Appeal-letter" meta_description: "Appeal against a disciplinary decision, your dismissal or a redundancy with this appeal letter. Set out your appeal with guidance from Rocket Lawyer." time_to_complete: "15 minutes"
More than just a Appeal letter template, our step-by-step interview and guidance makes it easy to create your document. Easily create online, download, print and sign your free Appeal letter in minutes. This document is also sometimes called: Employee notice of appeal .